We’d love your help. 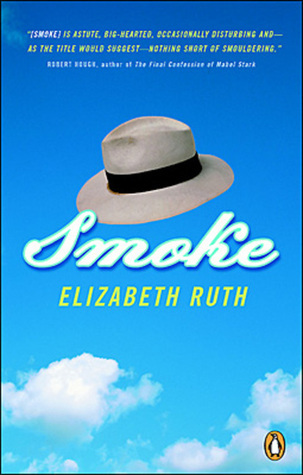 Let us know what’s wrong with this preview of Smoke by Elizabeth Ruth. In the 1950s, in the Ontario tobacco-growing community of Smoke, a young boy on the verge of manhood is scarred forever. A night out with his buddies, too much booze and a lit cigarette, and Buster McFiddie’s life will never be the same. Through the process of healing, one man’s voice speaks to him, softly, to ease his pain, spinning yarns of The Purple Gang, the notorious In the 1950s, in the Ontario tobacco-growing community of Smoke, a young boy on the verge of manhood is scarred forever. A night out with his buddies, too much booze and a lit cigarette, and Buster McFiddie’s life will never be the same. Through the process of healing, one man’s voice speaks to him, softly, to ease his pain, spinning yarns of The Purple Gang, the notorious Detroit mob. It is the voice of John Gray, the town doctor, and soon it’s clear that telling these tales means as much to Doc as hearing them means to Buster. In an era of conformity, a disfigured boy tries to move his life forward, and an old man grapples desperately with his past: the convergence of two lives on the cusp will change each of them, and the small-town world that binds them, in ways they could not have imagined. To ask other readers questions about Smoke, please sign up. This is a book about tobacco, wounds and the healing process. I love how the Buster is drawn out of his marginalization by the doctor - slowly and with great care. I love the stories within the story. This is a book about transformation - on many levels. I quite enjoyed this book. There was enough going on that it kept me entertained, but not too much so that it was difficult to keep track. I also found it really cool to read a book that takes place in the county I live in. My only complaint is that the identity of one of the characters/storylines is not revealed, and I'm really curious about who it was. To be completely honest I read this book only grudgingly at first. I had to fill in a book bingo square and this one fit the bill. It soon won me over. The characters are full and complicated and soon I was very interested in the lives of these small town dwellers. Wow! I loved this book. I live in the area, so I understood exactly where the locations were that Ruth was referring too. The end...wow!! Journey towards self-acceptance that goes beyond physical appearance. A surprise twist in the book that will be for you to discover. In 2013, Elizabeth will also publish a Good Reads Books novella for adults with low literacy. Love You To Death is a Psychological thriller. In 2003 Elizabeth edited an anthology entitled: Bent On Writing, contemporary queer tales. Elizabeth is well known for her mentorship of aspiring writers. She teaches at the University of Toronto, and within the Humber School for Writers Correspondence Program. Recently Elizabeth held the position of Writer-In-Residence at the Toronto Public Library. She has also recently delivered workshops and offered manuscript evaluations to writers in northern Ontario. Together with parenting writer Ann Douglas, Elizabeth Ruth delivered professional development workshops to writers across Canada. Elizabeth Ruth is the current chair of the author's advisory committee of the Writers' Trust of Canada.